In short the GOP cares about the wealthy, while the Democrats remain the champions of the little guy. As John Nolte has pointed out, unfortunately this utter falsehood has made some inroads…especially with the middle class. This is an argument that the Romney camp can thoroughly debunk. How to do it dawned on me a while back while I was standing at the checkout counter of the local grocery store. I went in to pick up a gallon of milk. While there, as often happens, I loaded the basket with some other items I needed. Cheese, cereal, jam, bread, peanut butter, coffee, sugar, butter, pretzels, grapes, toothpaste, those sort of basic every day items. The cashier rang up and bagged my purchases and I saw that my quick trip for milk and a few nick-knacks had run me almost fifty bucks. I stuffed the receipt into my wallet next to my Exxon receipt for the fill-up I’d just gotten down the street. Also fifty dollars. So, I’d dropped a c-note from the time I left work until the time I walked in the front door. I am forty-five. No spring chicken but certainly no old fogey either. 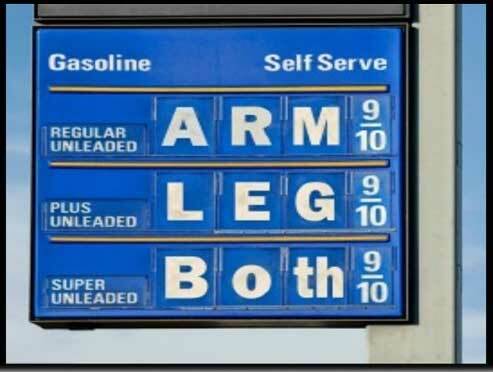 I can remember a time when if you spent $100 at a gas station and a grocery store it meant that with gas just 70 cents a gallon, most was spent on the latter. And when I saw someone spend an astonishing $100 at the food store they were usually stocking up for weeks with a pushcart overloaded with purchases and bags and bags and bags of goods. Not anymore. Ol’ Ben Franklin don’t get you much these days. My story is typical in 2012. But why? It’s called inflation. I don’t mean the artificial ‘core inflation’ proffered by the Fed that strips out food and energy before calculating the Consumer Price Index (CPI). I’m talking about the real cost of living for every American…rich, poor, high tech guru or working class Joe. Since January 2009 the price of practically every commodity has risen, sometimes substantially. Why do I pick January 2009? Because late 2008 to early 2009 is when with Obama’s blessing the Fed began its so-called ‘quantitative easing’ to stimulate the economy by buying up treasuries to flood the money supply with dollars to keep interest rates artificially low and, hopefully, stimulate economic activity. It is classic Keynesian dogma come to life–one that offers government action can create real growth. The problem is that commodities are traded in dollars. And there is no better way to devalue a dollar, therefore make raw materials more expensive, than for the Fed to expand its balance sheet, which it has done at heretofore unheard of levels in an effort to: a) prevent deflation (done, but never necessary); b) promote price stability (fail); c) increase employment (epic fail). These numbers imply real pain for the average American on a budget with a stagnant wage or, if unemployed, eating through their savings if they have any. True, ‘core inflation’ has stayed relatively tame. But what good is it that the price of a iPod has remained constant if you’re paying through the nose for food or your commute? And as for the Democrats primary fear targets, seniors, whose social safety net benefits have increases tied to the core CPI, this dismissal of the cost of living in its calculation (thus lowering benefits increases) is having a serious impact on your real standard of living. China does not utilize the ‘core inflation’ gimmick–because they have no welfare system with payment schemes that favor their government if it shows a more benign CPI; and even though their official inflation is higher than ours, somehow the Renminbi has appreciated against the dollar, go figure. With the exception of natural gas, which is in so much supply that it has withstood the upward pressures of a falling dollar, every major commodity has increased in price during Obama’s presidency. And these numbers do not even reveal the true pain that the middle class has suffered because several of them, cotton for example which at one point had appreciated 200% before finally selling off, are not even near their highs…yet they still show dramatic net increases from four years ago that spell trouble for the typical American on a budget. So what do we have to show for what Mark Steyn described as “pouring a trillion dollars into the Potomac and watching it float out to sea”? Anemic economic growth, unemployment (official) that has remained above 8% longer any period in modern history since the Great Depression, more Americans claiming Social Security disability than finding new employment, an explosion in federal debt that will eventually fall upon posterity to pay off if ever, and all the while the loss of real purchasing power and diminished true value of savings in a ‘hidden tax’ that no one can escape unless they walk everywhere, don’t eat, don’t drink, and bundle up in their living rooms in wintertime. All this at a time when the middle class can least afford it. This is an argument that a sharp and serious man in command of the issues like Paul Ryan can make forcefully and clearly. As George Will has said “Paul Ryan is eight years younger than Obama but vastly more experienced and conversant with these issues.” The Democrats know this and dread this man having the bully pulpit…as their graveyard whistling aptly demonstrates. And yet, in words dripping with cynical irony, David Axelrod, offers that the GOP ticket presents the middle class with a choice between a “punch in the nose and a knee to the groin.” Now, I don’t know whether this Obama machine champion of the little guy was speaking from his new $1.7 million-dollar, 3,320-square-foot 42nd floor Chicago condo. But I do know that when true middle class Americans drag themselves out of bed every morning to go to work in Obama’s America (should they be so fortunate to have a job) they find that the shrinking dollars that remain in their wallets buy much less than they did four years ago. For wealthy guys like David Axelrod, the price of a carton of eggs or an electric bill is of little consequence of course. But the vast majority of Americans may find that with friends like the Obama administration destroying their purchasing power and the value of their diminished savings the middle class needs no enemies. It’s time for the GOP to make the case with the conviction that comes from being on the right side of history and the right side of mathematics. And Paul Ryan is just the man to do it.